Highland Falls is one of the sportiest layouts in the Valley. The par-72, 6,512-yard course lies at an elevation of 3,053 feet, which means it offers stunning panoramic views of the Las Vegas Valley. 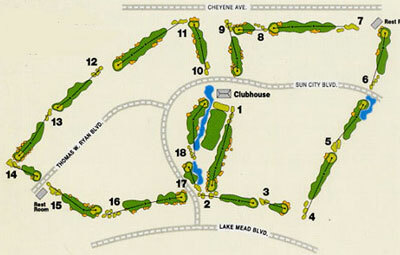 The front nine features rolling hills, which get steeper on the back nine. The four par 5s all play more than 520 yards. Two of the par 4s, the 4th and 6th holes, play 432 and 421 yards respectively, while the other eight all play less than 390 yards, but with the elevation changes, strategic fairway bunkering and well-bunkered greens, they all present fair challenges. Three of the four par 3s play less than 170 yards, while the 14th hole plays 206 yards. From the tee, one of the highest golfing points in the Valley, players can look down to the southeast and see the entire city. The eighteenth hole is a great test for golfers. The par-4 dogleg right plays 387 yards. Water runs from tee to green on the right, while the left is guarded by native landscaping. The green is well protected by twin slopping bunkers on the left and lake on right.